The United Nations Security Council has passed a unanimous resolution to freeze the assets of the exiled Liberian leader, Charles Taylor. It calls on all UN member states to locate and freeze funds owned or controlled by either Mr Taylor, or his wife or son. 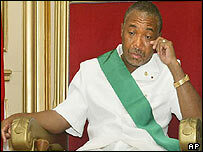 Mr Taylor resigned and fled to Nigeria last year after the Liberian capital Monrovia was surrounded by rebels. He faces war crimes charges at the UN-backed tribunal in Sierra Leone. His former residences in Liberia have been searched by investigators from the tribunal. A recent UN report, commissioned by the Security Council, accused Mr Taylor of continuing to divert Liberian government resources, even from exile. He has been accused of acquiring a personal fortune through illegal trading in diamonds and arms. The US - which drafted the resolution - says Mr Taylor's assets are scattered all over the world. The resolution says that the former president and his associates are undermining "Liberia's transition to democracy".